[NAIAS 2008] Hands-On With The Cadillac CTS Info/Entertainment System | OhGizmo! 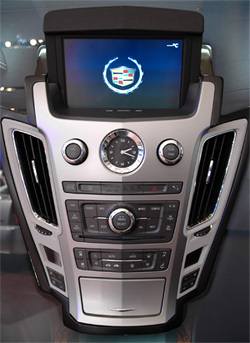 CNET recently awarded the 2008 Cadillac CTS as the ‘Tech Car of the Year’ in its 2007 Car Tech Awards. And if you had told me this before I attended the NAIAS this year, I would have thought it to be an odd choice. Even though the CTS looks nothing like the Cadillac of yesteryear, I still wouldn’t have considered the brand to be a leader when it came to the in-car technologies that interest me most. But I’m happy to admit I was wrong. While at the show I was able to get a private demo of the Cadillac CTS‘ stereo and navigation system from Randy Schwarz who’s the Vehicle Line Executive of Global Luxury RWD at GM. When you get into the car one of the dominating features is the center stack where all of the ‘goodies’ are laid out. At the top is a small LCD display that actually rises to reveal a larger, touch screen version which is easily the best way to navigate the stereo or GPS system. The stand-out feature of the CTS is the included 40GB hard drive. Using a built in USB jack you can copy MP3s from a flash drive onto the drive, allowing you to port your MP3 collection (or at least a small chunk of it) to the vehicle. Alternately you can simply insert an audio CD and let the stereo automatically rip it to the drive. Track information is then provided by Gracenote (formerly CDDB) saving you the hassle of having to enter it by hand. Of course hard drive based stereo systems are nothing new, but the CTS’ ability to record up to 60 minutes of XM or live radio is. Basically it works like a TIVO for radio, allowing you to pause or record any station and play it back later. While this feature probably isn’t that useful for building a music collection, it’s ideal if you’re a sports fan or talk radio junkie. If you’re interested, after the jump I also take a look at the navigation features of the CTS’ including the integrated traffic system. While at the show I made a point of checking out as many of the included navigation systems as I could from all of the manufacturers, but given the choice I would probably opt for what the CTS had on-board. As I understand it the map info is provided by Alpine and they’re just starting to introduce actual 3D building architecture for about 20 major cities in the US. This includes Detroit as you can see in the shot above. While the scale of some of the buildings is way off, being able to see on-screen what you should be seeing out your windshield is a big help. The nav system can also integrate real-time traffic data from XM NavTraffic, and allow you to plan routes that avoid any trouble spots. One of the easiest ways to ‘go green’ right now that many people overlook, is to simply avoid the amount of time your vehicle is running. A traffic-equipped navigation system is an easy way to ensure you’re not wasting time as you creep along in heavy traffic. There’s also a huge list of other features that I didn’t get a chance to really play with including DVD playback, a full MP3 jukebox allowing you to sort and search your music by any category, as well as iPod integration giving you access to music and playlists on your portable device via the vehicle’s interface. There’s also voice recognition controls which are compatible with virtually every feature that the entertainment system offers, which oddly enough is something the Ford SYNC system seems to push pretty hard, where as I don’t see much mention of it in the Cadillac marketing. Of course the biggest downside is that this system is only offered on Cadillac models that start around $40,000, and even then it’s an extra $3,000 option. I can guarantee that college students buying their first car would love a stereo system with a 40GB hard drive, so hopefully an option like this will eventually make its way onto every model in the GM lineup. While the Ford SYNC system might not be as elaborate as what the CTS has on-board, I have to give them credit for providing the core technology on almost every vehicle in their lineup, even if the stereo systems themselves are not as elaborate on lower-end vehicles. Overall though, I have to agree with CNET when it comes to the CTS. To say I was pleasantly surprised when playing around with all its toys is an understatement. While the car isn’t quite on my shopping list just yet, my stereotypical take on Cadillac as being a brand only my Dad would be interested in has definitely changed. 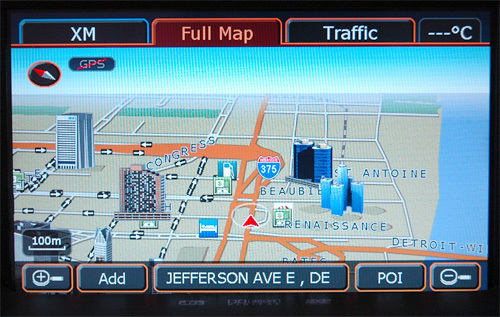 DO YOU SELL A TOUCH SCREEN NAVIGATION SYSTEM FOR A 05 CADILLAC CTS ? I have a 2007 Cadillac CTS and the nav system cannot be reprogrammed while the car in drive. This is very frustrating since the passenger could program while the driver drives. Is there a bypass to enable the system to perform all functions while the car is moving? If not, Why can't this be controlled by the passanger seat airbag sensor? If a passanger is seated, the nav system is fully functional while driving. I have been in many other cars where the nav system is fully functional while driving (Honda, Nissan etc.) This is very frustrating and not a user friendly system. Any help would be appreciated.